Nigeria recently approved new excise duty rates for tobacco products and alcohol beverages, which would be effective from 4th June 2018. We discuss the new policy as it relates to tobacco products. 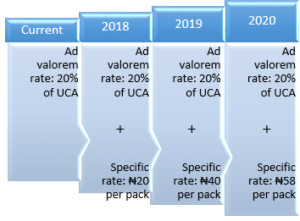 The new policy would maintain the current 20 percent ad valorem-based excise duty rate on tobacco products, and introduce an additional ₦1 specific tax on each stick of cigarette in 2018, which would increase the price per stick to ₦2 in 2019 and eventually ₦2.90 per stick in 2020. This corresponds to a gradual increase in excise duty rate of ₦58 per pack, spread over three years (Figure 1). 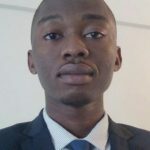 This article briefly describes the build up to this policy development; highlights the important contributions of Centre for the Study of the Economies of Africa (CSEA) to the stakeholder engagement process, and examines the potential impact of the policy change on public health and fiscal revenue. Prior to this policy development, Nigeria has had two notable tobacco control legislations. Specifically, the Tobacco Smoking (Control) Act of 1990 that sought to control smoking in certain areas and restrict tobacco smoking advertisement and the newer and relatively broader National Tobacco Control Act (NTCA) of 2015, which was an attempt to domesticate the Framework Convention on Tobacco Control (FCTC). 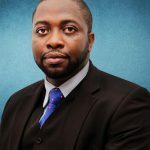 Civil Society groups have been campaigning for the implementation of effective tobacco control measures in Nigeria, especially under the auspices of the National Tobacco Control Alliance (NTCA), which CSEA is a member. 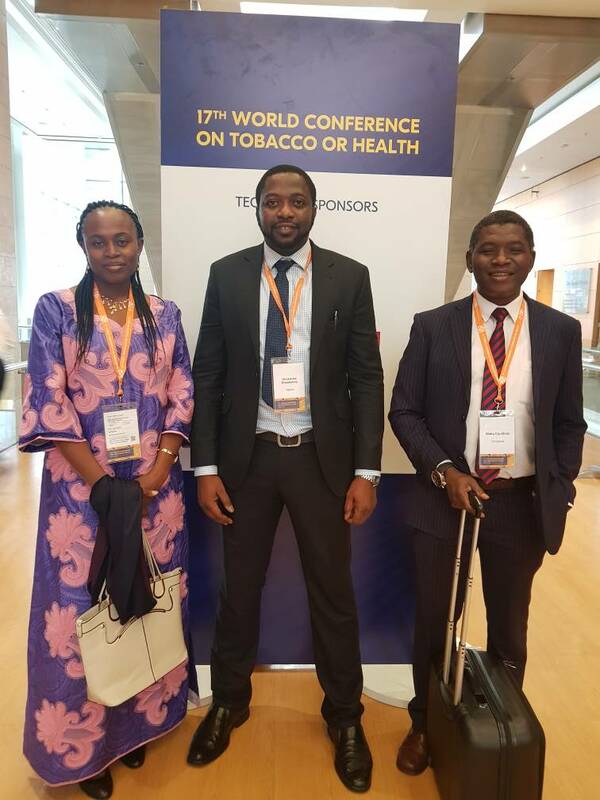 These advocacy efforts have gained momentum in recent times and received international support, partly in response to tobacco industry targeting of emerging market in Africa. Over the years, health concerns have been the primary basis of tobacco control advocacy in Nigeria. Correspondingly, recent macroeconomic concerns have necessitated a new drive for government to seek innovative ways of mobilizing revenues. This provided the opportunity for tobacco control advocacy to take on another key dimension, in addition to the initial grounding on public health issues. Particularly, CSEA joined other tobacco control advocates to present tobacco taxation to the government as the most effective policy measure. Tobacco taxation can save millions of lives, reduce poverty, and raise revenues for financing development. Tobacco taxation is popular among policy makers because of its dual positive effect on public health and government revenue (a win-win policy option). Moreover, realized tax revenues can be earmarked to fund key social programmes which generates grassroot support. The confluence of sustained and dynamic tobacco control advocacy and current government motives resulted to the policy development in discussion. It is important to paint the picture of Nigeria’s tobacco market in order to develop an appreciation for the new tobacco policy. Available data shows that 5.6 percent (4.7 million) Nigerian adults aged 15 years or older used tobacco products: 10.0 percent (4.2 million) of men and 1.1 percent (0.5 million) of women. Consequently, tobacco related diseases account for about 17,500 deaths per year: about 207 men and 130 women per week. The economic losses associated with tobacco use are estimated at US$ 591 million. 18.4 billion Cigarette sticks were consumed in 2015, with an average pack of cigarettes costing approximately ₦183.50 in 2017. Despite the huge costs caused by tobacco, tobacco excise tax remained very low for a long time, at 20 percent ad valorem rate charge on Unit Cost Analyses (UCA). This corresponds to a tax burden of just 6.5 percent compared to the WHO-recommended 75 percent. Source: Infographics designed by CSEA using information from GATS, Tobacco Atlas, Nigerian Customs Services, and a primary price survey. These signal the urgent need to implement effective policies that curb the rising smoking prevalence rates and associated impacts. Tobacco taxes are considered to be the most effective tobacco control measure, hence the importance of this new tobacco tax policy. In what follows, we outline the public health and fiscal revenue implications of the policy. In order to examine the impact of the change in tobacco tax policy on public health and government revenue, we carried out a Tobacco Tax Simulation Model (TETSiM). The TETSiM is an advanced excel-based simulation tool developed by the University of Cape Town’s Economics of Tobacco Control Project, but was adapted and empirically applied by researchers at CSEA to fit the local setting. Using TETSiM, we are able to calculate the effect of this policy on public health (measured as reduction in cigarette consumption) and government revenue (measured as revenue from excise tax on cigarettes only) over the next three years, 2018 – 2020. We show the effects of this policy in four possible scenarios that accounts for economic growth (calculated using World Bank’s GDP growth projections for 2018, 2019, 2020) and tobacco industry response (increase, decrease, leave industry /net-of-tax price unchanged). 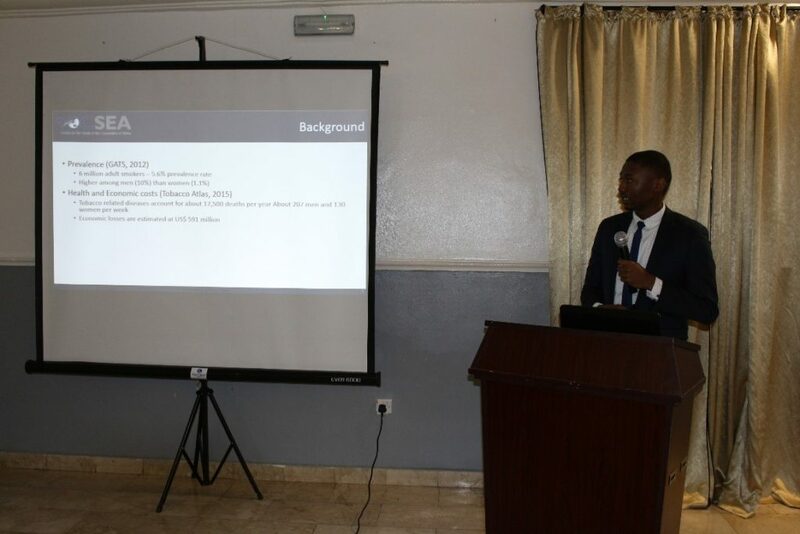 The data input used for this model were mostly derived from national sources including the Nigerian Customs Service, National Bureau of Statistics, and Global Adult Tobacco Survey (GATS) among others. 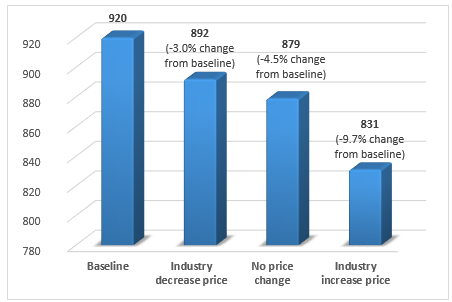 Other key data such as price and income elasticities were collected from secondary literature. See appendix for model data input and key model assumptions. The results of the model show that the quantity of cigarettes consumed by smokers in Nigeria will fall over the next three years. Cigarette consumption will fall by a larger percentage when the tobacco industry (consisting of producers, wholesalers and retailers) passes on the excise tax burden to consumers; without decreasing the net-of-tax price on cigarettes. 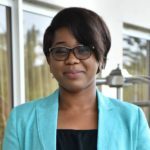 The present study shows that if the tobacco industry takes up the excise tax burden by decreasing the net-of-tax price by 10 percent, the quantity of cigarettes consumed in Nigeria would fall by 3.0 percent by 2020 (from 920 million cigarette packs in 2017 to 892 million cigarette packs by 2020) (Figure 2). However, if the tobacco industry increases the net-of-tax price on cigarettes by 10 percent, cigarette consumption in Nigeria would fall by 9.7 percent by 2020; from 920 million cigarette packs in 2017 to 831 million packs for cigarettes by 2020 (Figure 2). If the industry leaves the net-of-tax price unchanged, cigarette consumption will only fall by 3.4 percent (to 879 million cigarette packs). 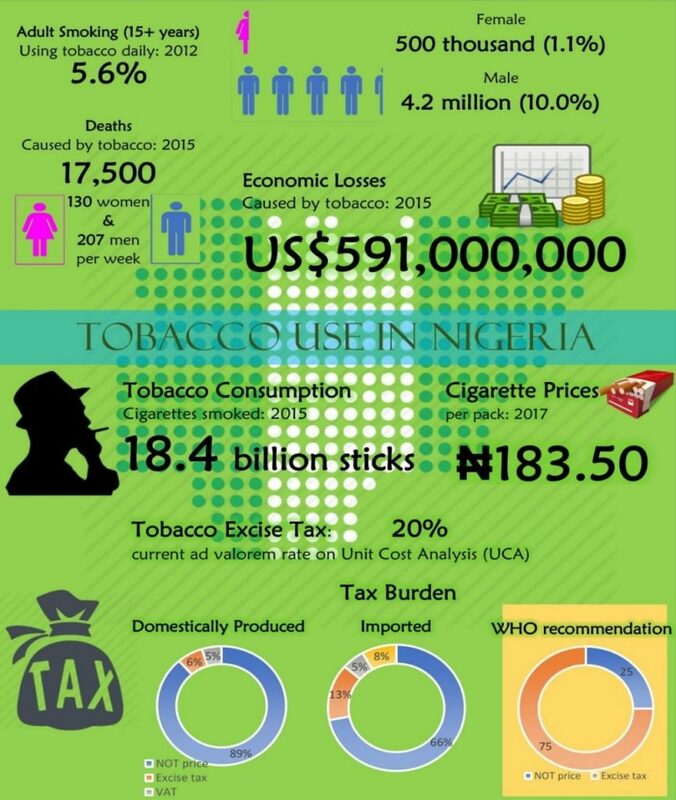 Given the oligopolistic market share of the tobacco industry in Nigeria, it is therefore more desirable for the tobacco industry to over shift the tax burden to consumers by increasing its net-of-tax price — as this will have the largest impact on public health. How does this happen? An increase in the excise tax should reflect as an increase in the price of cigarettes if the tobacco industry transfers the excise tax burden to cigarette consumers. This would then lead to a reduction in cigarette consumption via a decrease in the growth of: i) the number of the adult population that smoke cigarettes (i.e. smoking prevalence), and ii) the number of cigarettes remaining smokers smoke (i.e. smoking intensity). Asides the change in tobacco excise duty rate, the change in tobacco excise tax structure/system (which now includes a specific tax portion) is also desirable, as it will give less room for cost manipulation by the tobacco industry. Therefore is more likely to yield the desired reduction in cigarette consumption when compared with a tobacco excise tax system that is purely ad valorem. Nevertheless, a complete change from ad valorem to specific tax system is more desirable. Ideally, the higher the price of cigarettes under a specific tax system, the greater the reduction in cigarette consumption and the greater the benefits for public health. While the new excise duty on tobacco products (which amounts to about 17% excise tax burden) is a step in the right direction, its effect on cigarette consumption and public health would be minimal relative to the excise duty on tobacco products recommended by the World Health Organization (WHO). The WHO-recommends a tobacco tax policy amounting to 75% excise tax burden; this would yield a larger decrease in cigarette consumption relative to the recent tobacco tax policy. Thus, the government should aspire for more radical tax policy for tobacco products. In the meantime, efforts must be made by the government to ensure that unintended consequences from the new excise tax policy, such as an increase in illicit trade, is minimized. Particularly, improving border control and monitoring mechanism through track and trace system is important. The track and trace system is a mass serialization solution that prints a unique identifying code onto each cigarette production after it has been packaged. This will allow consumers and government officials to distinguish illegal cigarette products from the legal cigarette products, and help resolve the illicit trade problem. The results of our TETSiM show that excise tax revenue to the government from cigarette tax revenue will increase significantly over the next three years. The present study shows that excise tax revenue to the Nigerian government, from cigarette production, will increase significantly. Based on the present model, the government will generate more than thrice the current excise revenue whether or not the tobacco industry passes on the tax burden to consumers, since the excise tax is levied on cigarette production not on consumption. 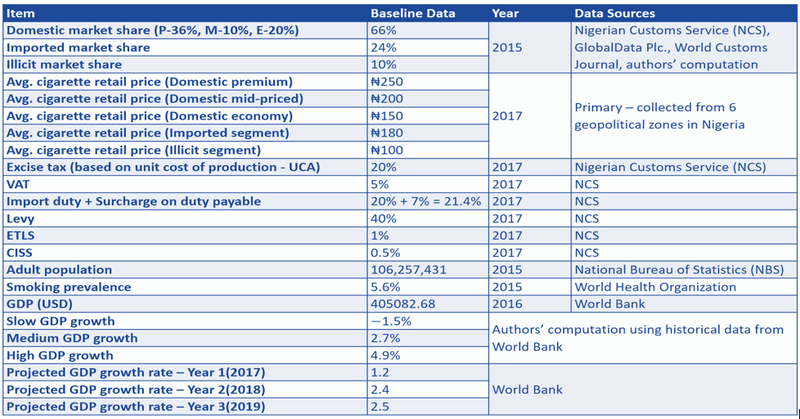 Specifically, the model result show that the Nigerian government will collect an excise tax revenue of at least N37.3 billion from cigarette production by 2020, irrespective of industry response (Figure 3). This projected excise tax revenue would even be higher under the tobacco tax policy recommended by the WHO. However, it is possible that the government may lose a portion of the projected excise tax revenue due to illicit trade. Therefore, it is important to monitor for unintended consequences from the new tobacco tax policy. Particularly, the track and trace system for tobacco products in Nigeria should be promptly initiated to address any potential illicit trade problem. Government’s efforts in involving relevant stakeholders in reaching this celebrated policy position is laudable and needs to be sustained. However, despite the clearly identified policy motives of improving public health and generating fiscal revenues, there are unintended consequences that may emerge, which should not be easily discounted. Specifically, the expected effect of the new policy on prices of tobacco products can create a setting for illicit trade in tobacco to thrive. Therefore, the government needs to follow up policy implementation with rigorous monitoring, evaluation and border control. Furthermore, this policy needs to be backed by complementary tobacco control measures that limit the growth of illicit trade, such as tighter border controls. Moreover, the level of political will for tobacco control shown by the present administration is a motivation for CSEA to continue to generate evidence on crucial tobacco related issues, especially relating to unintended policy impacts, such as on inflation and illicit trade in tobacco products. Other issues captured in CSEA’s ongoing tobacco control research include understanding the level and dimensions of price dispersion in the cigarette market; cigarette affordability; incidence of tobacco taxes; and earmarking of tobacco tax revenues. Tobacco taxation, though hailed as the most effective tobacco control measure, is only one of the numerous other evidence-backed tobacco control measures. These other measures are nicely captured in the WHO’s MPOWER acronym. To guarantee holistic socioeconomic benefits of tobacco control beyond just realizing tax revenues, these measures need to be integrated into a strategic tobacco control programme that the government must be committed to pursuing. Industry price (or Net-of-tax price): This is the price of a pack of cigarettes after all taxes (VAT and excise) has been subtracted. 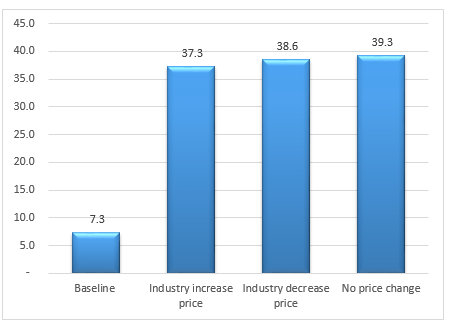 This is the price set by the industry, depending on their manufacturing costs and desired profit margin. Illicit trade is the sale of products that were either smuggled, counterfeited, or evaded taxes.